Although technically it's more of a documentary than a musical, I suppose there are many people who would put Woodstock in the "Musicals" category if they were categorizing everything in their home library. And it's not hard to see why, being as this remains quite possibly the most famous concert of all time, and it takes a documentary that is almost 4 hours long just to give the viewers some idea of what it was like to be there during those 3 days that made history. If you're reading this, chances are you already know more about the Woodstock festival than I do, and you probably don't need me to tell you all of the performers who are in the film. I'll just say that my favorites of the performances that were included in finished version include Janis Joplin, Jimi Hendrix, Jefferson Airplane, and Santana. Woodstock was recently reissued on DVD and BD and I think either version does a very good job of attempting to preserve the movie's unique multiple aspect ratio and split-screens, which offer a rich texture as the filmmakers capture everything from the performances on the stage to the day-to-day conversations that took place in the festival, and also the reactions from those who lived in the area and whose lives were briefly and memorably disrupted by the 3-day concert. There is so much to see and hear that the movie's 3-hour-and-43 minute running time doesn't feel long at all; the biggest fans of the musicians who performed at the festival might even wind up wishing there was an even longer cut of the documentary that included more of the performances. It is nothing if not fascinating to see how much idealism there was among many of the young people who were there and who were obviously deeply impacted by the experience, which attracted so many people that it became impossible to keep it a "fenced" concert. 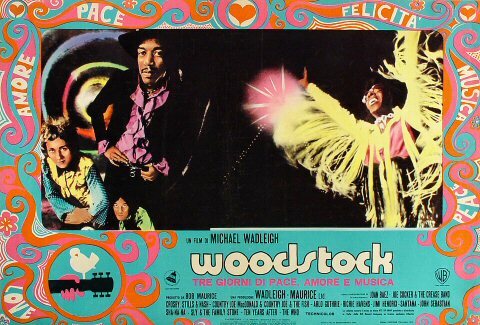 Woodstock even got some lovin' from the Academy, receiving the Oscar for Best Documentary Feature. Also nominated was editor Thelma Schoonmaker, who like Martin Scorsese worked on the editing of this project. If you are going to go into that realm, "Gimme Shelter" ( the Stones at Altamont) is actually a better film. Devastating. I haven't seen Gimme Shelter yet, but I'd like to. I did watch Shine a Light and enjoyed it a lot, too. Part of the appeal of Woodstock for me was that I'd never seen it and I always wanted to learn more about that incredible festival. Warning: "Gimme Shelter" is not a feelgood film, although the Stones and Airplane are in top form. Thank you for the warning, finance, I'll keep that in mind. Next week will mark the 40th anniversary of the Woodstock festival. If you haven't had a chance, try catching this movie on DVD or blu-ray. It's an experience you won't soon forget. The movie will also be receiving a limited re-release in several cities - check your local listings! Gimme Shelter is an excellent movie, because it clearly gives a much more accurate portrayal of what really and truly went on at many, if not most of those rock concerts during that period. Woodstock, on the other hand, from what I've heard/read, wasn't all that the movie cracks it up to be, because, in addition to the fact that there were a lot of bad drug trips at Woodstock of 1969, there were a number of rapes (which went unreported, because back then, people didn't report rapes), other violence, plus at least 3 people died: One kid got run over by a tractor truck while sleeping in a sleeping bag to get out of the rain, one guy died of a heroin overdose, and another person died of a ruptured appendix. Another person was seriously injured due to falling off of a scaffold. When Woodstock was made into a movie, all of the above-mentioned stuff was deliberately cut out to make it seem more gentle than it really was. No, it isn't. Gimme Shelter is a good interesting movie, because it presents a much more accurate, rounded-out portrayal of what really and truly went on at a lot of rock concerts, at that time. I wholeheartedly agree, DownGoesFrazier. "Gimme Shelter" was a much darker, more devastating film than "Woodstock", but that's probably why I found it more appealing. "Gimme Shelter" is a much more honest film than Woodstock, to boot. Gimme Shelter is a much more interesting film as well. It's devastating, but necessary, if one gets the drift. Gimme Shelter is a much more interesting film, because it portrayed not only the decline of rock concerts, but gave a more accurate portrayal of what really and truly went on during rock concerts at that time. Yea, Woodstock was the Gone with the Wind of the hippie generation. I never thought of Woodstock as the Gone with the Wind of the hippie generation, but I can see your point. Actually, in reality the original Woodstock concert of 1969, in reality, was the beginning of the end of an era, if one gets the drift. The beginning of the end actually happened two years earlier. In 1967 after the (by many accounts disastrous) Summer of Love when San Francisco was inundated by scene-makers, some locals held a "Death of Hippie" funeral, complete with a mock coffin, in Golden Gate Park. Many of them moved north and left the city to the newbies and the hard-core druggies. I lived there for a while in 1969, the year Woodstock happened on the East Coast, and the city was its beautiful self, but the "scene" was already a mere shadow of its reputed former glory. I highly recommend Ang Lee's Taking Woodstock (2009), a beautifully done film about the creation of the festival from the perspective of the small town where it happened. A terrific movie from a masterful director. Some iconic images from the original film, such as the nun flashing the peace sign, are referenced. Thanks for the info, DougieB. The late 1960's, especially 1968, was the beginning of the end. Although I wasn't part of any of the stuff that happened back then, I have visited San Francisco 2 or 3 times since, and still think it's a beautiful city. In many places, including San Francisco, the hippies really were not welcome by the locals, at all. That was true here in Boston, especially in neighborhoods such as Southie (i. e. South Boston), Charlestown, and even East Boston, which were the more ethnically tribal areas of the city at the time. That was also true when the SDS (Students for a Democratic Society) attempted to make inroads in many working-class areas, including the above-mentioned Boston neighborhoods, which they were literally chased out of. There were certain other groups and singers, such as Bob Dylan, the Byrds, the Doors and a number of other rock stars of that period who'd been invited to perform at the 1969 Woodstock concert, but, for other reasons, weren't able to make it. Having the above-mentioned groups at Woodstock 1969 would've really brought that concert/movie to the heavens. Taking Woodstock isn't a documentary but it covers some of the events and people who made the festival happen, through the story of a young man who moves home to help his parents keep their seedy motel afloat. He's been issued a permit for a small musical event on his parents' property to generate interest in the business, which he offers to the producers of the "Woodstock" concert after they've been kicked out of their original location and weren't having any luck finding an alternative. He enlists the help of his neighbor Max Yasgur and the rest is history. Most of the focus is on the small town end of things, though he does spend some time in the outskirts of the festival itself. There aren't any musical performances, but there's a nice moment when he's standing by a pond full of people bathing and the sound of Richie Havens singing "Handsome Johnny" comes quietly wafting across on the breeze. Though the term makes me uncomfortable, I guess you could say that for a brief moment of time the Woodstock concert was an "ethnically tribal area", in the sense that people were motivated to gather with other like-minded people. That "boomer" generation (of which I'm a part) had a lot of cross currents within it, so it's not surprising that the idea of "hippie" didn't really take. Some stayed true to the back-to-the-land aspect and helped pioneer the "green" movement, some became more politically motivated, some never got beyond the drugs, and some dove right into careers which led straight to "yuppie". But even though it's romanticized, the movie and recordings of the Woodstock concert are still a powerful evocation of what togetherness can mean. Thanks again for the info, DougieB. I, too, am part of the Baby-Boom generation, but, for all kinds of reasons, did not take part in any of the stuff that went on back then. What I've heard/read, however, was that the town of WallKill, NY, where the 1969 Woodstock concert was originally scheduled to take place, lifted the permits, because the townspeople really raised a stink about it. So, the concert took place in a town roughly 40 miles north of WallKill, in Bethel, NY. Max Yasgur died of a heart attack two years after the whole Woodstock concert.